This piece originally appeared in "ReCreative" as a table with only three drawers across the top. Shortly thereafter I modified it to create the sideboard shown here. Though shy two drawers in this photo, the final product provides a large amount of storage space. 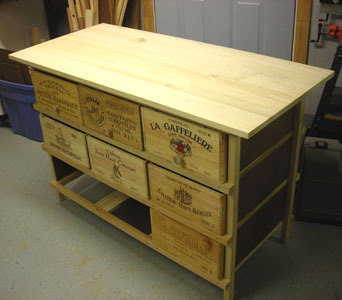 Fortuantely, most wine crates are made in a standard size, which makes it easier to find several that will fit together as shown. The light, unfinished framework relies on Masonite shear panels for rigidity.